Crochet is a wonderful pliable way to work with yarn. I will be in Alyth Town Hall over the weekend demonstrating some tips for getting started. Here is a wee example. I wasn’t terribly impressed with this motif and initially laid it aside. I then decided to add some surface crochet and changed the look entirely! My crochet evening classes start again in Invergowrie Hall on 22 April, and has had a lot of interest. There are only two places left, so don’t delay if you want one! The course costs £45 for 10 weeks. To enrol, please visit the CACE website. What a lovely turnout last night at the Harris Academy for enrolment for the Summer Term evening classes. There are just a couple of places left in my crochet class, and they can now be booked online through the HERA website. Price £43 for 9 weeks. I need to work out what I did here and write it down! It’s a variation on the pattern I made up for the red shawlette. I really should write down what I do as I go along! What shall I make with this? The results of my test squares. I ended up trying four sizes of hook. First my favourite is the 8mm aluminium It gave a firm texture, which would be fine for a rug or placemat. Second is a 10mm hook. The texture if this is coming out feeling good, not too tight with a bit of flexibility. The third one is a 12mm knooking hook. The texture of this initially came out feeling very soft, but a bit loose and slabbery. However, as I carried on, my tension evened out and become tighter. Hence the fourth hook. The fourth hook is a 15mm. I liked the result I got from this best of all. So here are my stitch and row counts from a 10 x 10cm square (4″ x 4″) for the four hooks, and photos in a gallery for you. 15mm hook – 7 stitches, 7 rows. 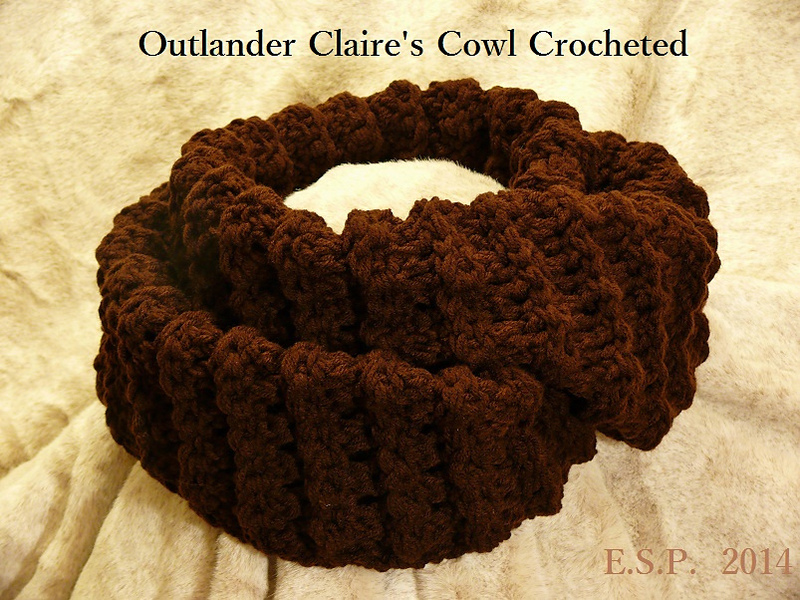 In searching for a project to use this yarn for I found a crochet version of Claire’s Outland Cowl on Ravelry. I rather like this. The link for it is here.